The ocean is a major service provider for local and global human activities, including transportation, food, and ecosystem services. As with other types of services, improved technologies and new knowledge should contribute to the transformation of the systems we develop and use. Ocean-based economies must be reevaluated if we want to have productive systems and sustained services. The ocean is a major service provider for local and global human activities, including transportation, food, and ecosystem services. We use oceans as major highways; they provide 90% of global shipping routes. We rely on oceans to provide the main source of protein for over a billion people. We use the ocean as an ecosystem service, as well. However, increased global human activity and carbonized development is affecting our ability to maximize output from ocean-based services. Inefficient shipping vessels, overfishing, and pollution affect human productivity profoundly. We need to reimagine emissions reductions and conservation efforts to maintain efficient use of the ocean as a global service provider. One way the banking industry can get old, inefficient vessels off global shipping lanes is offer trade-in incentives for shipping companies. Currently, shipping companies postpone the purchase of a new ship by waiting to have positive equity on old ships; yet equity continues to drop. Governments should set up a fund where they offer to pay the cost of the negative equity (to incentivize the decommissioning of old ships), and place an additional tax on those companies, which will then subsidize pro-environmental efforts. This takes the onus off companies to wait for positive equity on ships, takes surplus ships out of the global transportation chain, and provides a fund for environmental actions. However, not all governments would unilaterally adopt this agenda. Countries may be incentivized to free-ride by letting other governments pay to decommission their country’s ships first, then profit in the long-run from the removal of ships from the supply chain. The ocean needs more protected territory. In 2012, fish were the primary source of protein for one billion people, yet marine protected areas (MPAs) make up less than 3% of the ocean. The percentage of ocean classified as an MPA should be increased, especially along coasts where the population does not rely on subsistence farming. Protecting fisheries slows population destruction so habitats can naturally replenish, which will support fishing communities in the future, when local fish populations are at healthy, sustainable levels. Fishing communities may have to relocate (potentially to less productive areas) when the MPA is closed or they will be incentivized to fish illegally. Ecologically, however, marine species and habitats need to be given time to rebuild; proper protection ensures marine longevity, which is positive for fishing communities in the long-term. These marine environments also provide coastal barriers against the climatic and environmental disasters that are increasingly affecting coastal populations. In addition to providing barriers that protect coastlines during storms, the ocean has layers that help us fight climate change, as the ocean is a carbon sink, which stores carbon dioxide from the atmosphere. 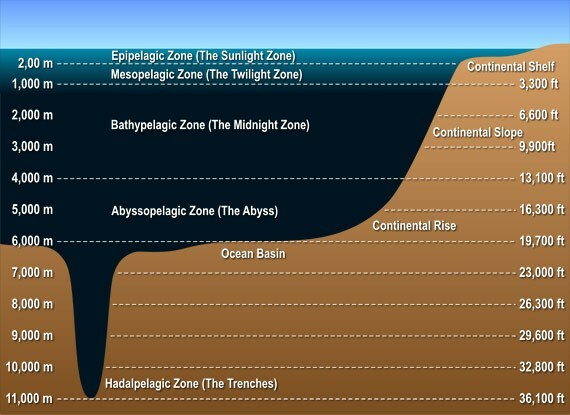 A helpful diagram of the layers of the ocean can be viewed below. However, overfishing in the epipelagic has opened the mesopelagic to fish-meal and fish-oil industries to support stressed fish farms. The mesopelagic houses 10 billion tons of animals; “cropping a mere 1% of this each year would double the landed catch of the ocean’s fisheries.” Adding this fishing source to the global food trade is desirable from a consumptive standpoint, but the broader problem of depleting ocean resources and rising atmospheric temperatures contributes to ecologically unsustainable practices which worsen climate change externalities. MPAs will help the ocean’s top layer, the epipelagic, regenerate healthy marine populations, so the mesopelagic layer can continue to sequester fossil fuel carbon and keep the atmosphere’s temperature at current levels, or ideally, lower. Thinking of the ocean as a global service provider will help us reimagine more sustainable practices. As with other types of services, improved technologies and new knowledge should contribute to the transformation of the systems we develop and use. Ocean-based economies must be reevaluated if we want to have productive systems and sustained services.